Okay, I've got to be honest here. At first this was cover love, pure and simple. As in absolute, undying, everlasting cover love!!! o.O I mean just look at it! The colors! The blending! The model and pose! It's just breathtakingly gorgeous. But it gets better. 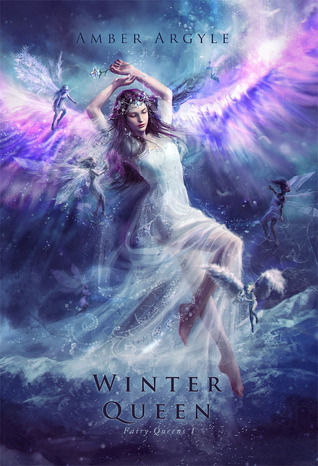 It's about fairies, and winter fairies on top of that! From the description I surmise this is set in another world or time, but it's hard to tell and I want to read it no matter what. Well with that cover you've got my full attention. Wow what a beautiful thing. I love books about fairies but I haven't read many. I hope you'll love this one. I actually hadn't heard of this one before. And you are right, the cover is absolutely beautiful. Love the synopsis! Yay. This is one of my picks this week too. Isn't the cover beautiful?.?. June seems so far away. Great pick. That cover is awesome and this book sounds awesome. WOW just wow! I'm so with you on the cover love. THAT. IS. GORGEOUS. YUM!!! Also the blurb sounds pretty awesome. I had never heard of this book before! Great choice! Beautiful cover, and the story sounds interesting. I'll definitely be reading it at some point. I've got a book crush now! That cover is absolutely gorgeous! And the plot also sounds very interesting. I love anything about faeries. Oh my - you did it again this week Carmen! I looked at the cover (♥♥!!!) and I read the synopsis and then made a beeline to Goodreads to add this one myself! Yes I definitely have cover lust for this one too but I really LOVE how the plot sounds :D Thanks for spotlighting another great one! MWAH! Would have stopped by your blog, but you didn't do a WoW post this week, did you? This is actually the first I've heard of this book. It sounds really good though! I haven't read many faerie books. This is a new book, I haven't seen it anywhere else. I actually don't do Top Ten Tuesday, but I saw your post. Thanks for the recommendations, I'll check them out. I don't read a lot of fantasy/fae books, but I do love that cover! Great cover! Looks like a great read. This sound interesting. I sure love the cover! I love the cover too.... must've been a week for awesome covers!! And fairies... Definitely my kind of book!! Thanx for visiting my WoW...last week!